With hours to spare I finished my bag for Quilt Market. I used the Birdie Sling pattern by Amy Butler. 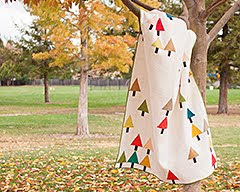 All of the fabric is Innocent Crush by Anna Maria Horner. 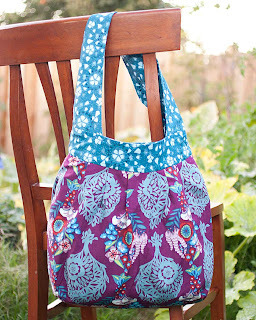 Sewing this bag was a challenge! I'm glad I didn't try this bag first. A few times, I found myself grumbling, "Oh NO!" quickly followed by, "It's ok! Everything is ok. Trust Amy! Trust Amy." The pattern is very very well written. The fact that I came out with a recognizable Birdie Sling is a testament to Amy Butler. Trust her. She knows what she's talking about. I mean look. Even the lines inside my bag match. That is no accident, it's all Amy Butler's instructions. I didn't even know I was doing it until it was done. I have a little sneak peek for you too. 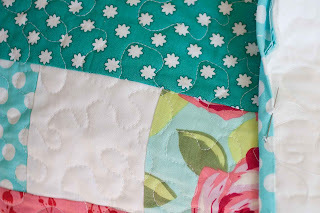 I've been working away on my Happy Blocks quilt. Look! Polka dot binding. 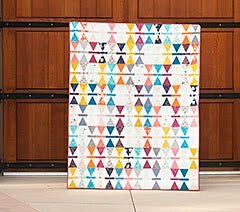 : ) The full reveal will be this Friday as part of Blogger's Quilt Festival. I can't wait to participate again this year. Anyone can join. I hope to see a bunch of you there!! Psst, eye spy a new header. 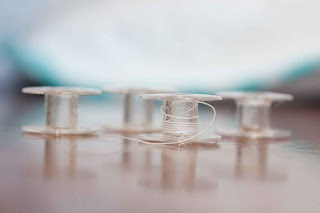 I pre-wound 4 bobbins of thread for this quilt and as you can see it was *just* enough! Phew! Thank you for all the sweet comments about DH! You guys make me smile!!! He is a keeper. ; ) He used to roll his eyes when I got fabric in the mail too. Now he's active on the forum and he's well versed in the language of Denyse Schmidt, Heather Ross, Amy Butler, Anna Maria Horner and Joel Dewberry. For those of you who have signed up, I'm sure you've seen posts by Tom the DH. Well that's him! *cheers* Hi Honey! He is the one who helped me pick out Innocent Crush by Anna Maria Horner for my bag. He also recognized the Love dots in the quilt above. Maybe we need more husbands signing up. We'll give them their own corner and they can talk amongst themselves. I think you could all benefit. Hee hee. One more thing. 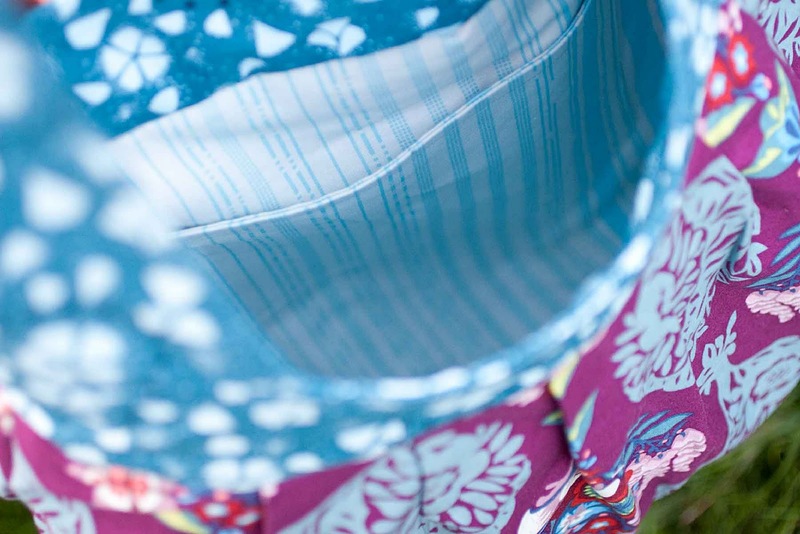 There is still time to enter the Bliss Giveaway. The winner will be chosen on November 3rd. Ok, I'm off first thing in the morning to Quilt Market. I will be posting lots of pictures on my blog and tweeting along the way. If you are good, I will bring presents to share. Yay!! Congrats on the bag, it's perfect! Love the sneak peek...polka dots are awesome, a favorite of mine since childhood. That bag is gorgeous! I love that pattern, and I have had that exact same experience with so many of her patterns-- I find myself thinking, "What the???" but it all comes out beautifully in the end. Well...you certainly have a keeper, my husband only encourages me to buy fabric (but I am way familiar with the eyes rolling) and he helps me match fabrics...and of course, he bank rolls me....but yours...go way beyond the call of duty...lucky you! The bag is wonderful! I do love the Innocent Crush fabrics so much!! I got your message about the package coming--that's FINE!! No worries!! The bag IS SOOO CUTE!!! Love the bag. In fact, I was spending my evening cutting out the pieces for my next birdie sling when I took a break for some online reading, and I saw your post! It's such a popular bag amongst the ladies in my family, everone wants one. Excellent title for your blog entry too. The bag is gorgeous. 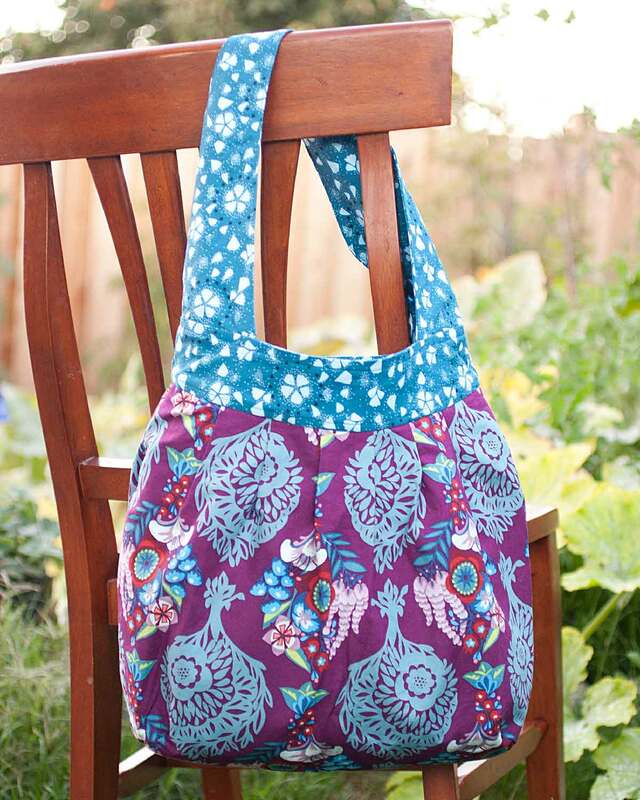 When the pattern first came out I thought about buying it but I'm not very confident that I will succeed in actually making a bag that will not fall apart after a week. Your quilt looks lovely too. 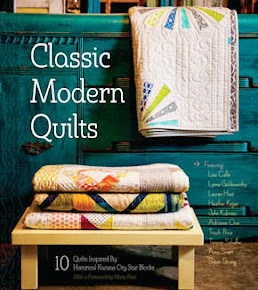 Have fun at the Quilt Market! Great bag! Have fun at Quilt Market! The bag looks wonderful! 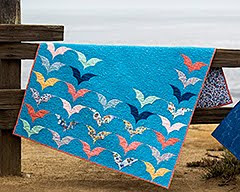 I am so looking forward to bloggers quilt festival. It should be loads of fun!! have so much fun at quilt market. i would love to go to one someday. Your bag looks great! Love the fabric you and DH chose :-) Have a blast at quilt market! I'm so jealous! That is the exact fabric I wanted a bag made from! Your DH has chosen well. Have fun at quilt market! 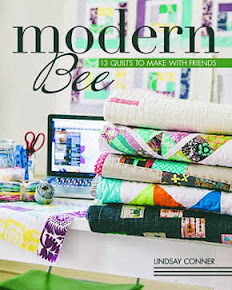 Have fun at quilt market - I am jealous! The bag looks great. Funny - he posted a comment on my blog, and I wondered whose DH he was! great bag! 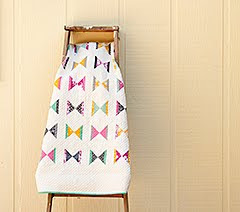 and that quilt looks like a winner! enjoy market! It's always nice when the plan works, isn't it? Gorgeous fabrics and such good work, matching up those skinny stripes! Too bad that bag's not just a wee bit (ok, LOTS) bigger...I'd hop in it & stow away to market with you! You'll have to share your finds here, please!!! Have fun! P.S. - aren't those helpful hubbies precious??? Mine does the color/print match and bankroll thing too. Most of the time, willingly!